I needed to put the word “treble” there, so you lil’ n00bies don’t accidentally think we’re about to sing endless odes about overpriced, posh studio gear. That’s for someone else. Frequency wise though, it does matter what’s going on on the high end of a track. It matters a lot for the sense of sheer quality and professional sound. The sparkle where the money is begins from around 8-10kHz, and goes upwards into the inaudible part of the so called audible range. While most of us won’t hear 20kHz, unless you’re really old and/or deaf, it will work for you up to about 15kHz. What’s there? If it’s a regular, old school pop/rock tune, it’s pretty much hi-hat and cymbals. It’s advisable to reduce most anything else on cymbals and the hi-hat, in case of a beefier, busier song with lots of elements. Their bell like high-mids can sound great and powerful, but it might be too much of a good thing when they compete with guitars, vocals, dog bark or cat meow, you name it. So what if your music doesn’t even have any hi-hats and cymbals? The good news is, you can use a lot of different things to occupy this special part of the frequency spectrum. The first group of these things are percussion instruments. Think shakers, tambourines and the likes. If you plan to use shakers though, make sure that you go for the studio versions. These are hissier due to the finer grain they are filled with. For this job, forget the rattly, raucous ones made for live performance. Another instrument that can sub for cymbals perfectly is acoustic guitar. You just need to tame any fullness in the lows and mids with EQ and compression, and (preferably) strum it. Like there’s no tomorrow. But you don’t even need to use separate instruments. On vocals, it’s natural to either use a mic that enhances this quality (then fight the sibilance of course). There’s also the fairly old trick of recording a separate whisper track and put it up parallel with the original one. On naturally middier elements though, the expensive sounding, brilliant high end can still be achieved. One approach is to use a fairly light and bright reverb. This will tend to move the element to the front, unless you make it as quiet as can be, with pulling down its level. Electric guitars work perfectly in this role (even distorted ones), especially with some chorus. The other trick is to go for the jolly joker, the exciter. These things inject gentle harmonics into the tracks. In other words, they can create the frequencies that weren’t even there to begin with. 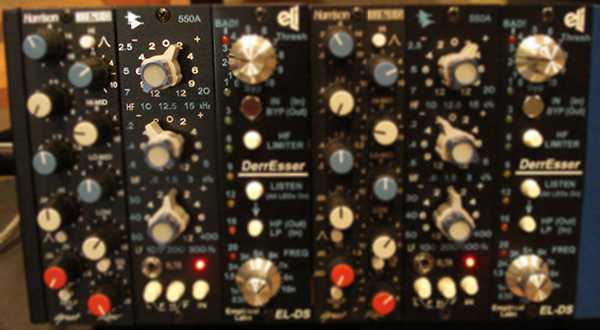 Many exciters have parallel EQs as well, so you have even more control over the delicate balance of your sounds. The things you need to be careful with are the above mentioned sibilance, and the hiss. While most of us don’t use tape with its signature hiss anymore, your devices, cables and the recording environment all generate or pick up some hiss. If it’s too much, try to figure out some other ways to dial in the money top end. Use a new instrument or record a farting mosquito for a whisper track. ← Previous Previous post: Big snare – want it?